Last month I stumbled upon a loony moon book I hadn't seen before, one that deserves consideration by all lunar observers. The book is The Moon: Considered as a Planet, a World, and a Satellite by James Nasmyth, C.E. and James Carpenter, F.R.A.S. It's subtitled "with twenty-six illustrative plates of lunar objects, phenomena, and scenery; numerous woodcuts &c." It was written in 1885. Astronomers may recognize the name Nasmyth: his name is attached to a modified Cassegrain focus design used in a lot of big observatory telescopes. Astronomy was just a hobby for him, though; he was primarily a mechanical engineer. His coauthor, James Carpenter, was an astronomer at the Royal Greenwich Observatory. 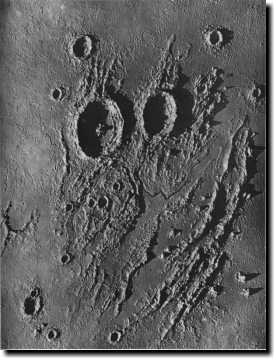 The most interesting thing about their book is the plates illustrating lunar features. In 1885, photography wasn't far enough along to get good close-up photos of the moon through a telescope. But Nasmyth and Carpenter wanted to show something beyond sketches. So they built highly detailed models of some of the most interesting areas of the moon, complete with all their mountains, craters and rilles, then photographed them under the right lighting conditions for interesting shadows similar to what you'd see when that area was on the terminator. I loved the idea, since I'd worked on a similar but much less ambitious project myself. 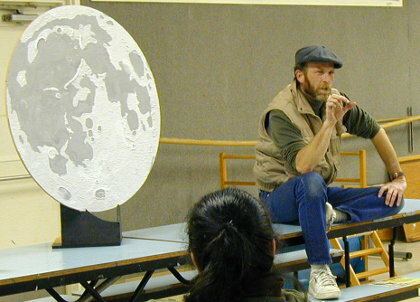 Over a decade ago, before we were married, Dave North got the idea to make a 3-D model of the full moon that he could use for the SJAA astronomy class. I got drafted to help. We started by cutting a 3-foot disk of wood, on which we drew a carefully measured grid corresponding to the sections in Rukl's Atlas of the Moon. Then, section by section, we drew in the major features we wanted to incorporate. Once the drawing was done, we mixed up some spackle -- some light, and some with a little black paint in it for the mare areas -- and started building up relief on top of the features we'd sketched. The project was a lot of fun, and we use the moon model when giving talks (otherwise it hangs on the living room wall). 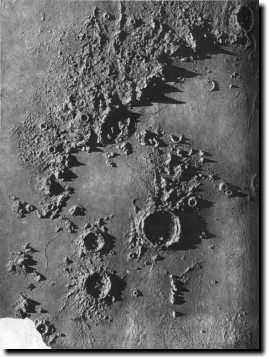 Nasmyth and Carpenter's models cover only small sections of the moon -- Copernicus, Plato, the Apennines -- but in amazing detail. Looking at their photos really is like looking at the moon at high magnification on a night of great seeing. So I had to get the book. Amazon has two versions, a paperback and a hardcover. I opted for the paperback, which turns out to be scanned from a library book (there's even a scan of the pocket where the book's index card goes). Some of the scanning is good, but some of the plates come out all black. Not very satisfying. But once I realized that an 1885 book was old enough to be public domain, I checked the web. I found two versions: one at Archive.org and one on Google Books. They're scans from two different libraries; the Archive.org scan is better, but the epub version I downloaded for my ebook reader has some garbled text and a few key plates, like Clavius, missing. The Google version is a much worse scan and I couldn't figure out if they had an epub version. I suspect the hardcover on Amazon is likely a scan from yet a fourth library. At the risk of sounding like some crusty old Linux-head, wouldn't it be nice if these groups could cooperate on making one GOOD version rather than a bunch of bad ones? I also discovered that the San Jose library has a copy. A REAL copy, not a scan. It gave me a nice excuse to take the glass elevator up to the 8th floor and take in the view of San Jose. And once I got it, I scanned all the moon sculpture plates myself. Sadly, like the Archive.org ebook, the San Jose copy is missing Copernicus. I wonder if vandals are cutting that page out of library copies? That makes me wince even to think of it, but I know such things happen. Whichever version you prefer, I'd recommend that lunies get hold of a copy. It's a great introduction to planetary science, with very readable discussions of how you measure things like the distance and size of the moon. It's an even better introduction to lunar observing: if you merely go through all of their descriptions of interesting lunar areas and try to observe the features they mention, you'll have a great start on a lunar observing program that'll keep you busy for months. For experienced observers, it might give you a new appreciation of some lunar regions you thought you already knew well. Not at super-fine levels of detail -- no Alpine Valley rille -- but a lot of good discussion of each area. Other parts of the book are interesting only from a historical perspective. The physical nature of lunar features wasn't a settled issue in 1885, but Nasmyth and Carpenter feel confident that all of the major features can be explained as volcanism. Lunar craters are the calderas of enormous volcanoes; mountain ranges are volcanic too, built up from long cracks in the moon's crust, like the Cascades range in the Pacific Northwest. There's a whole chapter on "Cracks and Radiating Streaks", including a wonderful plate of a glass ball with cracks, caused by deformation, radiating from a single point. They actually did the experiment: they filled a glass globe with water and sealed it, then "plunged it into a warm bath". The cracks that resulted really do look a bit like Tycho's rays (if you don't look TOO closely: lunar rays actually line up with the edges of the crater, not the center). It's fun to read all the arguments that are plausible, well reasoned -- and dead wrong. The idea that craters are caused by meteorite impacts apparently hadn't even been suggested at the time. Anyway, I enjoyed the book and would definitely recommend it. The plates and observing advice can hold their own against any modern observing book, and the rest ... is a fun historical note. Or, try your local public library -- they might have a real copy!